I've been kind of away from blogging more so this week. It's the week before finals. This week is just as busy as finals week because many things are due. Mica's been struggling with his honors Algebra. Travis asked his teacher if she thinks he should go back to the regular math class. Nope! He just needs to practice more. If we could get him past thinking he knows it all. Typical teenage attitude. Travis is brighter in math than I am, so he's been a very patient tutor. He's had to relearn things. Isaak has had about 2 hours or more of homework each night. I'm just not happy with his last year of elementary school. Every week I shake my head about something he says, brings home, and so on. The latest is that his teacher gave him a word to look up, find synonyms of, and use it in a sentence. He couldn't find the word in his not organized notebook. We snapped at him for not being organized. Then we learned that she gave him his word to write down, while he was in the middle of a test. Say what?! I've been helping Isaak with his homework. On the side meal prepping, snow shoveling, and basketball practice. All weekend last weekend and the weekend before I baked, and decorated. We have one less holiday function, so I made less sugar cookies. I broke about 7 of them that the boys ate. I also made Peanut Butter Sandwich Cookies - that taste a bit like the Girl Scout ones, Chocolate Malt Cookies, and Cherry Chocolate Chip Cookies. Lots of work, but 1 plate goes to Travis' work, 1 plate goes to my work, another batch goes to sell at the elementary school, another plate for Christmas Eve, and we typically have a New Years Dance Party for kids. I've also been working on my Christmas card, which will be a Christmas photo this year. I didn't get my rear end in gear to get postcards made. They are still cute. I'll share the flop, and will share the real one next Tuesday on here. I wanted to do a Parody on The Scream By Edvard Munch. It wasn't turning out as I envisioned. I played and played with it, then I played with something different that I liked better. So...I went with that. I'll start my real holiday baking next week for all of the family boxes. I can't wait to see your real card. Even the flop looks good! So sorry to hear that Isaak had a rough school year. 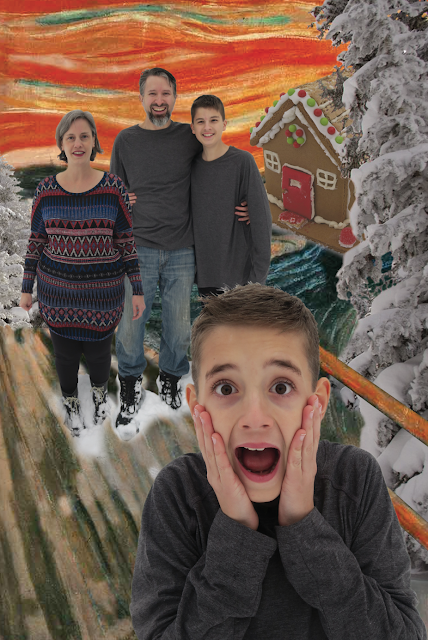 That themed Christmas card is really clever and so much fun! Thanks for visiting my blog. It’s neat that you know the K.C. Plaza well. My hubby is way better than me in Maths and tutors Lil Pumpkin for that subject too while I coach her in English and Science. It's a nice division of labour hehe..
Hope the boys have a better time in school after the holiday break! I think the flop is cute. I like the one you chose to use too.